So instead of posting a screenshot of my daily calories from www.calorieking.com, I've decided to do up some basic meal plans of the types of meals that I am trying to eat on a regular basis. I don't do this every single day - especially the lunch meal. For me, it is easier to bring salad ingredients into work (rocket, baby spinach leaves, carrot, capsicum, cucumber and mushrooms) and make a salad at lunchtime (adding some protein - usually tinned tuna because it is quick and easy). The dessert by the way is delicious! My four year old daughter doesn't like bananas - avoids them like the plague - loved her special ice cream. I added a tablespoon of low-fat greek yoghurt on top (after blending) so that it was a little creamier. But it is tasty even without it. 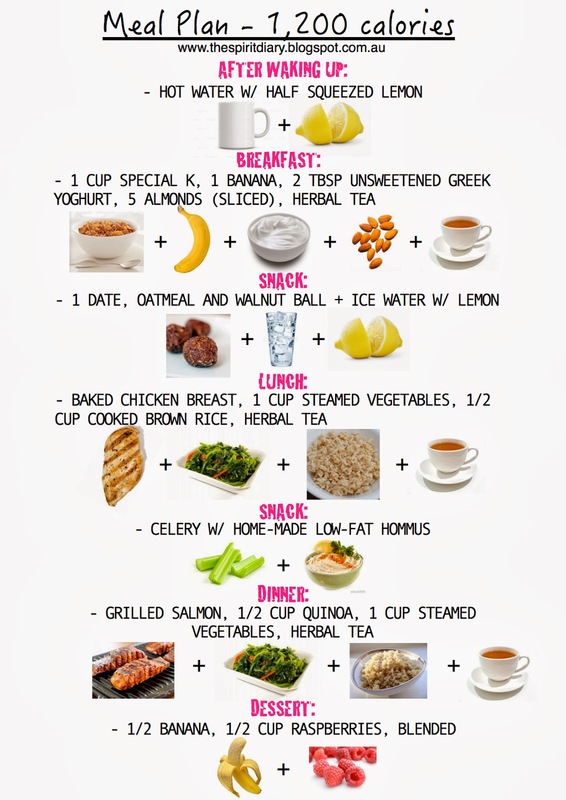 Im going to follow your 1200 calorie meal plan shown above. How much chicken breast can I eat. Im assuming 3-4 ounces? Can you post the rasberry and banana ice cream and home made hummus. I would appreciate it. Thanks! Do you have any suggestions coming off of coffee to herbal teas? The process..gradual or cold turkey?